After a few cool and rather comfortable days, we had hot and humid weather again in Tokyo. I met a friend of mine for lunch at Ginza Toyoda. 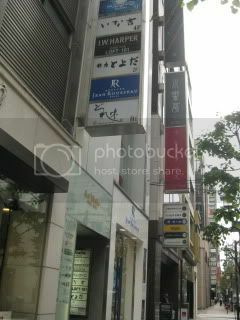 It’s a small kaiseki restaurant, which is tucked in one of thin business buildings a few blocks from Ginza’s main street. 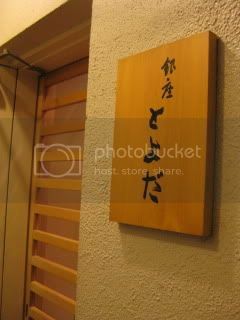 From the outside sign, you wouldn’t know it’s an authentic elegant Japanese dining (and this restaurant is also awarded with Michelin 2 stars). It’s typical in Ginza. Once we entered the restaurant, we were greeted by a hostess and guided to a counter in front of the main chef. 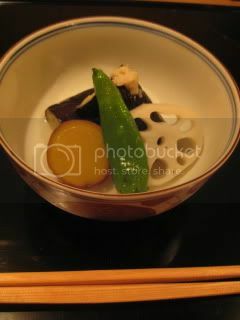 As soon as we sat down, I noticed 2 beautiful hand-crafted donabe (clay pots) behind the chef. 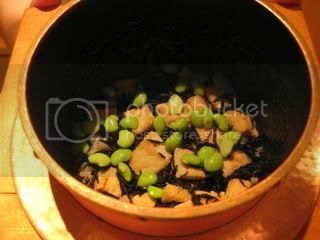 They were from Shigaraki, which is neighbor of Iga, so it showed some similarities to Iga-yaki donabe. We had one of their lunch course menus. I started with Asahi Shuzo’s “Kagua” Beer, red label. This beer by a microbrewery in Niigata Prefecture was brewed with “grape sansho” (type of sansho berries). The beer was brewed in Belgium and shipped back to Japan for bottling. It was supposed to be drank cool (not cold). The aroma had nice subtle sansho character, and the taste was really nice. I enjoyed it very much. 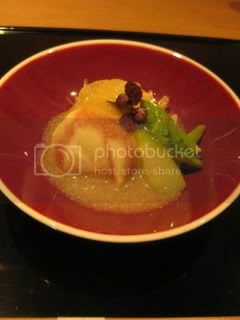 The lunch course was a truly sophisticated kaiseki and I savored every detail of each dish. 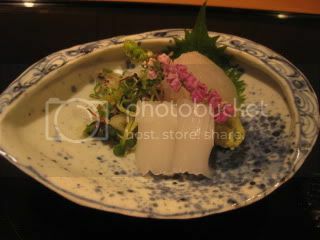 I got to take pictures of only some of the dishes we were served and I wish I could show all the dishes here. One of my favorite dishes of the meal was grilled ayu (river fish). 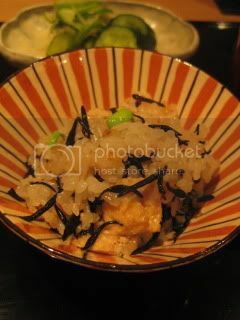 The head and tail were deep-fried and served with the body which was boned without filleting the fish and grilled. It was so meaty and clean.